Green Acres has all your needs covered and has two convenient locations in Whitehall (Allentown) and Easton, PA! When it comes to furnishing your outdoor space, one of the best options to consider is cast aluminum patio furniture. Aluminum furniture is rust-proof and lightweight, making it easy to move and store. When you add stylish cushions, these furniture sets become as comfortable as they are durable. Made from 100% recycled milk jugs and plastic, poly resin is an environmentally-friendly alternative to traditional outdoor wooden furniture. 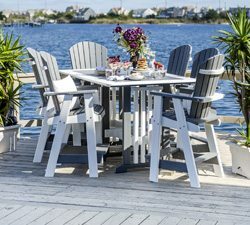 Poly furniture is not only durable, but has all the comfort and beauty essential to creating a comfortable and inviting spot in your patio or backyard – without compromising style and durability. With more than 30 styles of sheds and garages, a variety of gazebos, pavilions, pergolas, pool houses, and sunrooms available and hundreds of options to choose from, we can create the perfect outdoor structure for your backyard! Our high quality structures built with excellent materials, are locally constructed by the best craftsmen. If you love to grill, then you’re at the right place! We love to grill too and we recognize the need for high-quality grills and accessories to enable you and your family/friends to enjoy outdoor BBQs time after time! Check out our choice of grills and grilling accessories. Our vinyl swingsets and wooden playsets will provide hours of entertainment for your children, getting them outdoors in the fresh air! We offer a wide array of customizable playsets (including ships, castles, and trucks). Green Acres Outdoor Living has two convenient locations in the Allentown and Easton, PA area. The staff at Green Acres Outdoor Living would consider it a privilege to assist you in any way possible. We also offer delivery and set up in all of PA and New Jersey, for your convenience!